We provide free non-stop transportation from Onward Beach Resort Hotel to the course by taxi or van, and a non-stop share-ride bus for the return. The latest GPS system is included on all of our golf carts. It gives you valuable information, including your driving distance, accurate yardage from your car to the hole, the size and shape of the green, the speed of your golfing, and so on. We strongly encourage you to review our rules and playing regulations before your visit. Here is information to assist golf tournament organizers in the planning of golf events, including Scoring, Parties, and Prize preparation. *For rentals please apply at the Golf Course front desk on the day of play. The rental price for Clubs Rental and Shoes Rental is one set of clubs - $40 Shoes - $10. For a one-week period during your stay Clubs Rental and Shoes Rental will be free of charge after a one-time payment of the regular fee. For guests wishing to rent clubs and/or shoes, such rentals will be free of charge at both Onward Talofofo Golf Club and Onward Mangilao Golf Club after the initial payment. 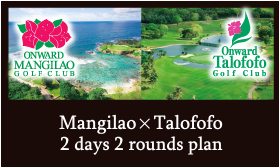 For guests who pay for rental services at Onward Talofofo Golf Club then go on to play at Onward Mangilao Golf Club, rentals will be free of charge after the initial payment. In such cases, please bring the receipt for rental payments or your start sheet and present these to the reception at the next golf course. *Please ask the front desk when you check in.